We rented our studio on Valencia Street almost five years ago! It has been so great to host letterpress classes and craft nights but one problem with it is it doesn’t get enough natural light to shoot in so we’ve always had to go off site for photo shoots. I have a lot of big projects coming up and I finally decided to look for a real space just for Oh Happy Day. Where we can make things, keep our desks and do shoots. I’m dreaming of a place like The Nine Studios (maybe a tad smaller) with lots of light and where we can continue hosting events and craft nights. 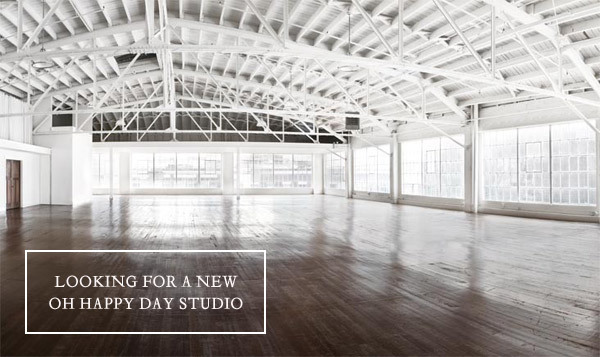 Know of any amazing warehouse spaces with lots of windows in San Francisco? The Nine Studios space is BEAUTIFUL. I die. I LOVE all that light! So gorgeous – good luck! This building is full of amazing locations. That space is to die for! I am already picturing setting up photoshoots there! I used to have a studio at American Industrial (aciproperties.com) I still miss the great light in there. The folks in the office (at least a few years ago) we’re fantastic to work with too. I love a place with so much natural light! I can feel the creativity! Cotton Mill Studios in Oakland has some spaces with AMAZING light. Congratulations for this big change, I hope you find your studio very soon!! This must be exciting for you. Natural light brings in better pictures. That’s why I love shooting in the day. What are you shooting for, price wise? What’s your budget? I don’t live in the area so I can’t help, but good luck finding a new studio! You’ve done so well with the space you have now – if you’re working around limitations like that I can only imagine how great it will be when you have a better studio!